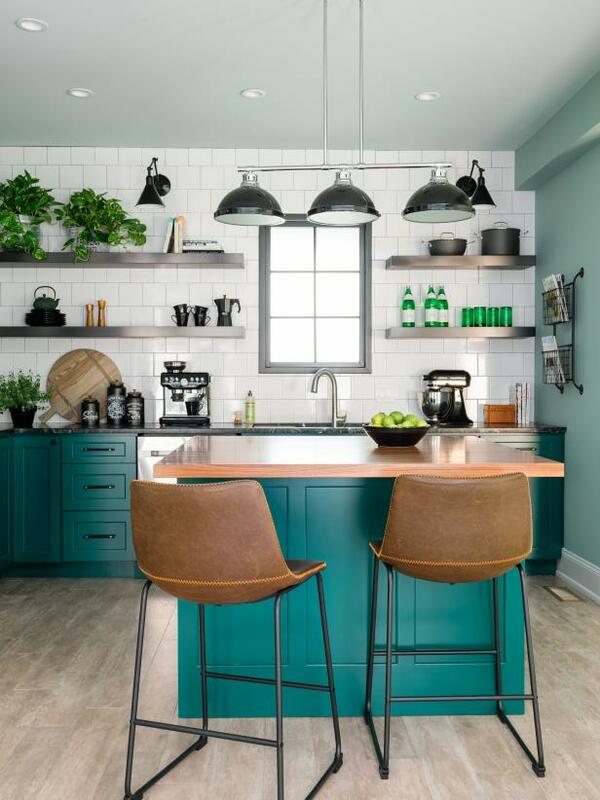 This open concept kitchen incorporates modern details with timeless style in a soothing, neutral color palette with splashes of green. 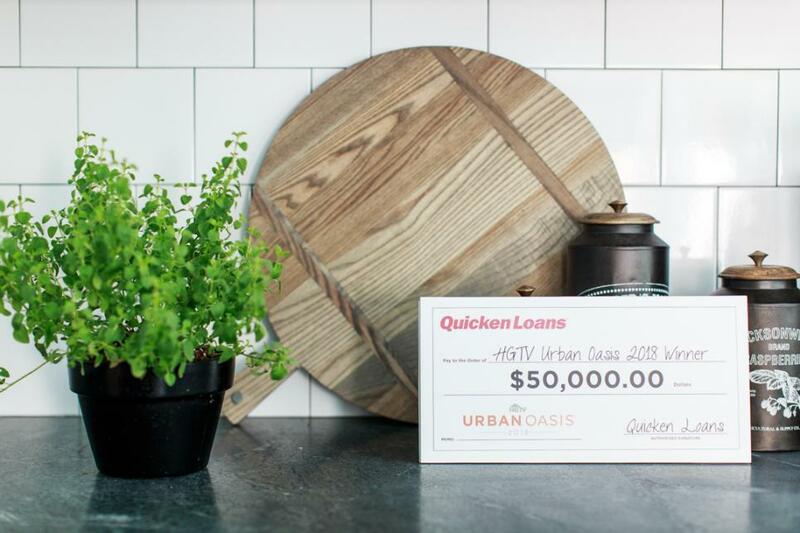 The mixture of handsome details and natural textures results in a calm and casual kitchen perfect for cooking and entertaining. 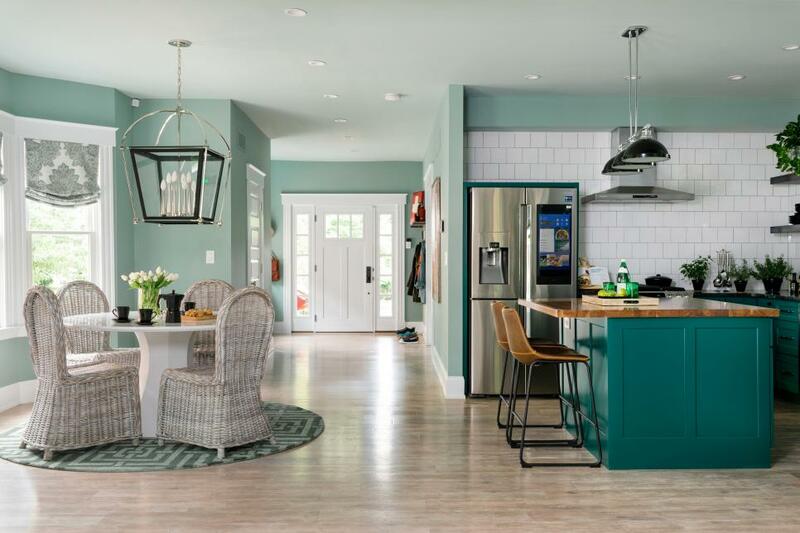 A custom pine needle green island with a walnut counter centers this spacious and open kitchen by designer Brian Patrick Flynn. Tile in clean white is a sleek and simple backdrop for this inviting space. 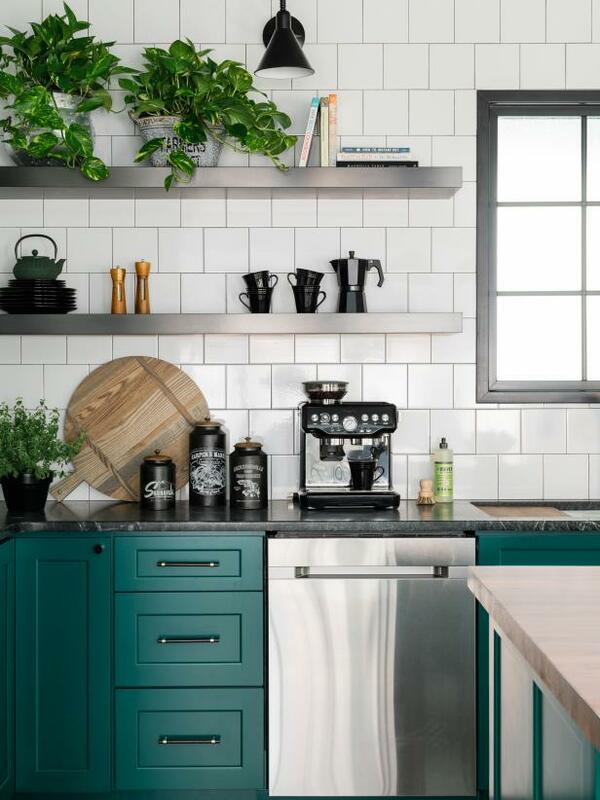 Open shelving in a zinc finish provides extra storage while the custom green cabinets add a masculine, natural note. 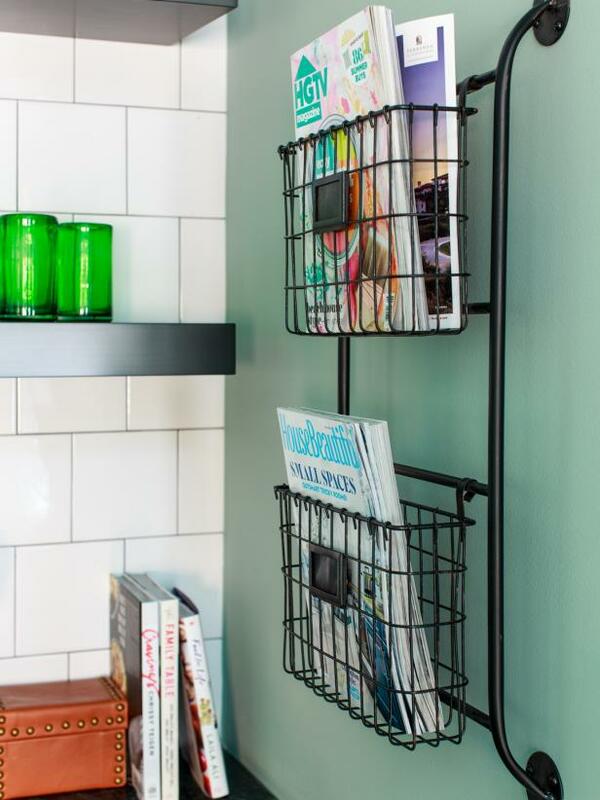 Black wire storage racks add industrial detail and make the perfect home for magazines and cookbooks. 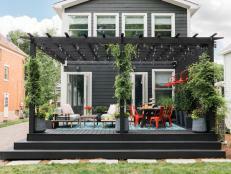 The mix of white, black and sage green feels cool, calm and fresh. 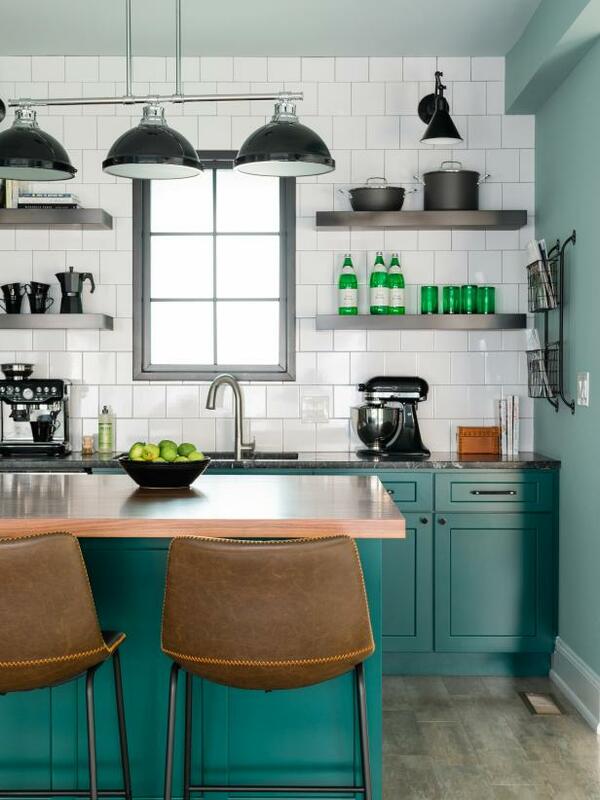 Dark green soapstone counters are clean and modern against green cabinets and the white tile wall. Handsome black and silver pulls on the drawers add a polished, finishing touch. 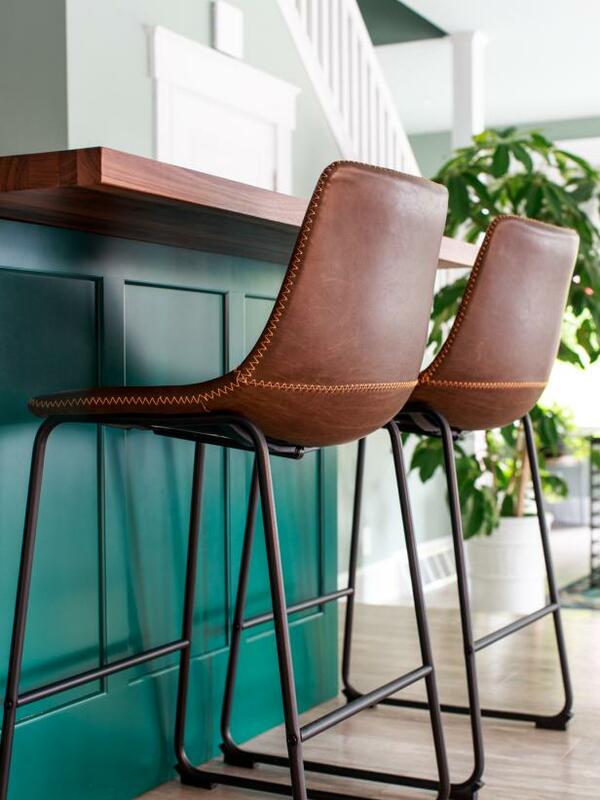 Matching leather bar stools at the island are the perfect spot for a quick morning coffee or entertaining guests before dinner. 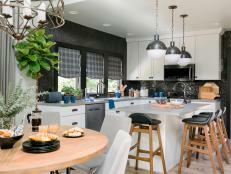 A trio of pendant lamps in matte black add soft white light to the space and incorporate soft task lighting for the island. 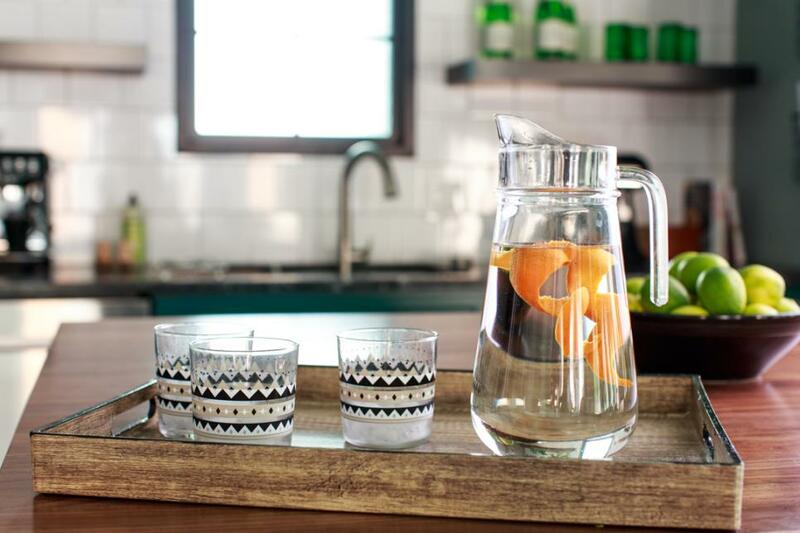 A sleek silver faucet adds modern design and timeless durability to this relaxing kitchen. 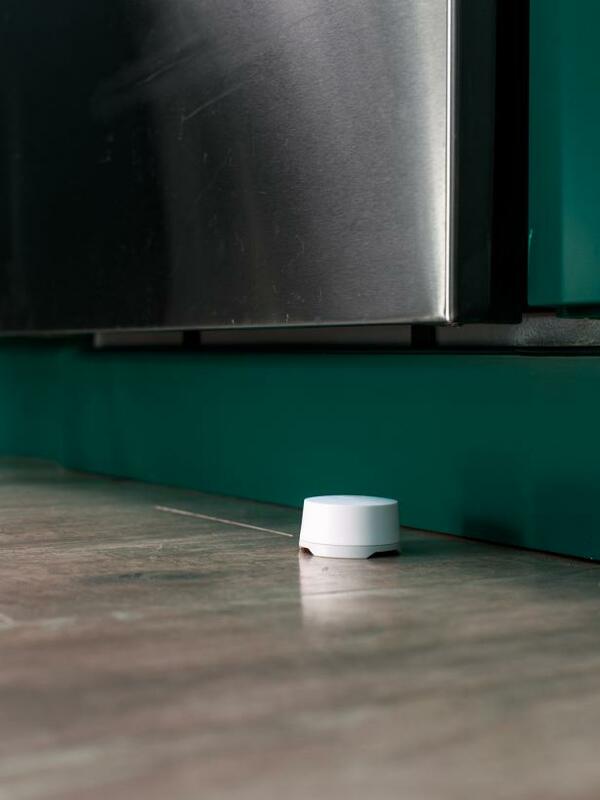 The large cutting board contains crumbs to the sink keeping counters neat and clean. 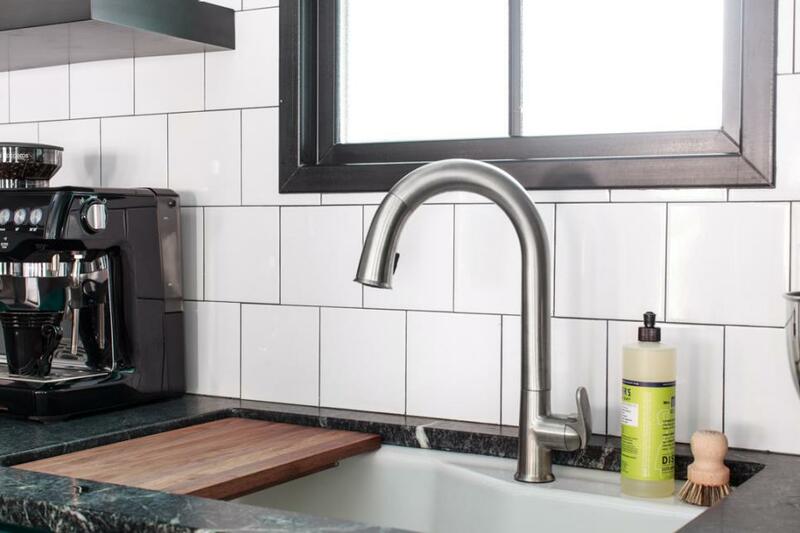 A water system filters out impurities to bring the cleanest water to this kitchen oasis. 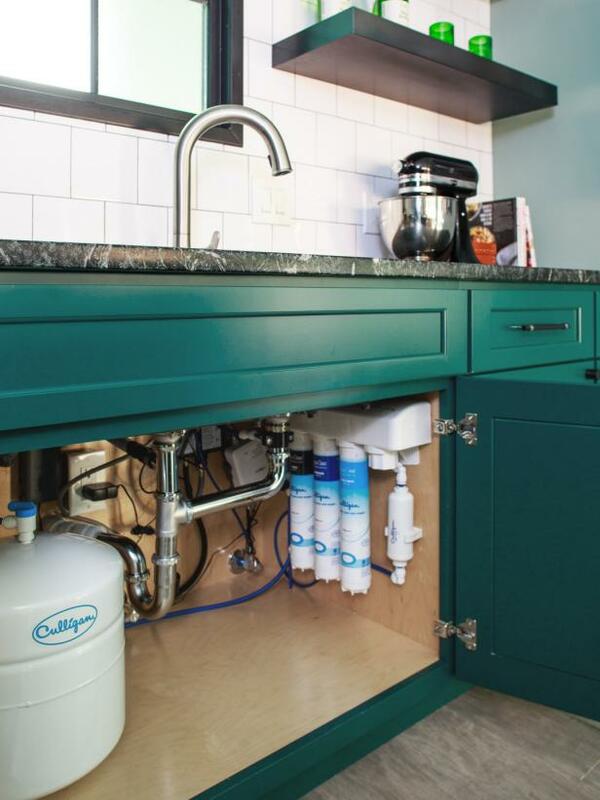 A self-contained under cabinet water filtration system is easy to use and delivers fresh filtered water on demand. Natural light floods this open-concept kitchen from the window above the sink. Opaque glass in the window conceals the stairway on the other side of the wall while still allowing natural light into the space. 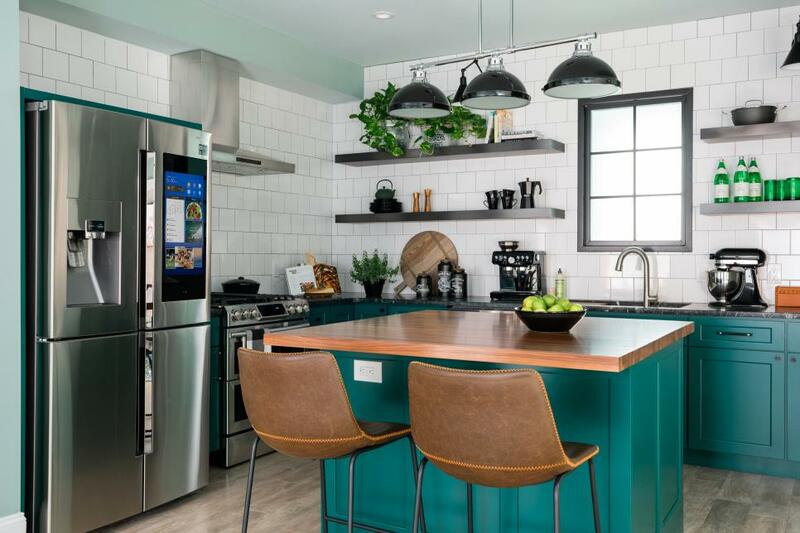 Stainless steel appliances from Samsung add sparkle and sheen to this modern, industrial kitchen. 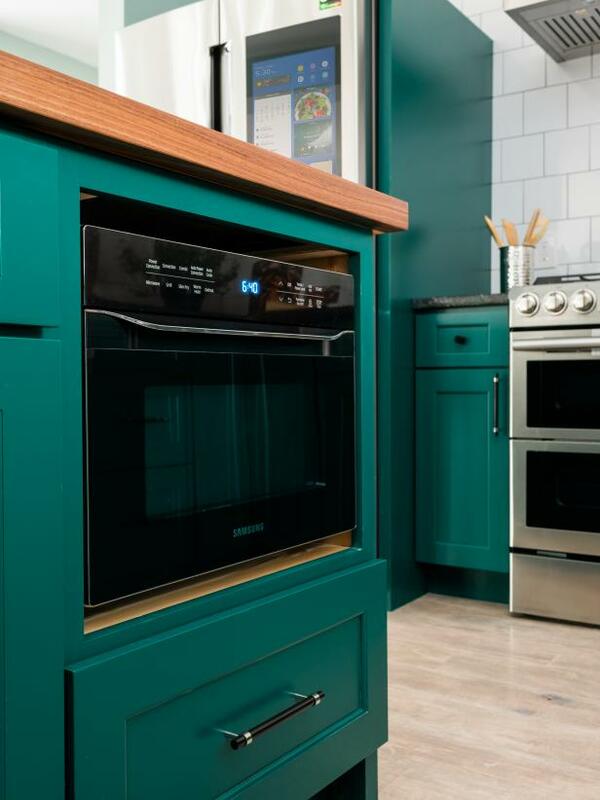 The mix of pine needle green cabinets, with black, white and wood tones creates a soothing culinary sanctuary. 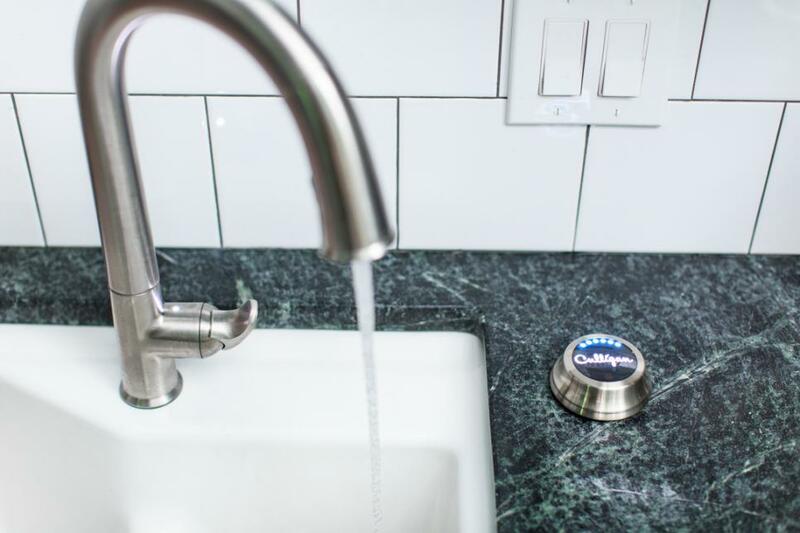 This clever technology acts as a water sensor alerting homeowners of leaks, which if undetected could pose damage and flooring issues. 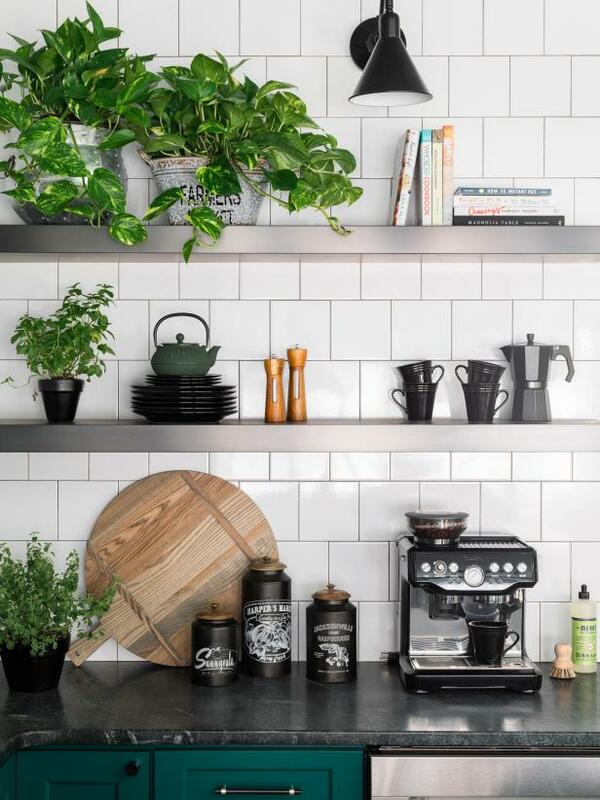 Open concept zinc shelving and a mix of plant and matte black accessories feels chic and spacious. 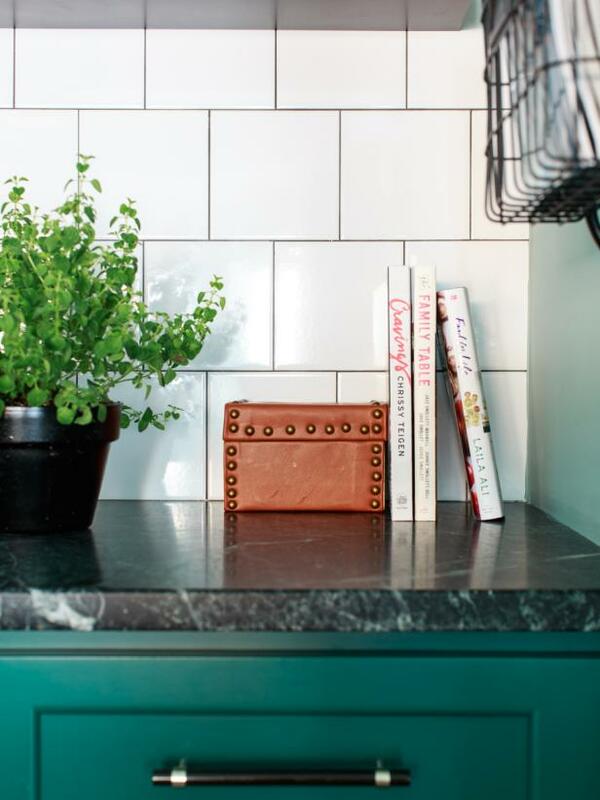 The deep green soapstone counters feel fresh against classic 6x6 tile in classic white. 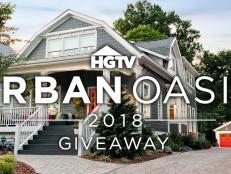 The lucky winner of HGTV Urban Oasis 2018 will also take home a check for $50,000. A sleek gas stove in stainless steel adds subtle shine to the classic design of this calm kitchen. 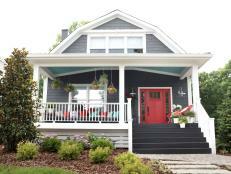 The L-shaped layout of the kitchen maximizes the space and puts essentials easily within reach. 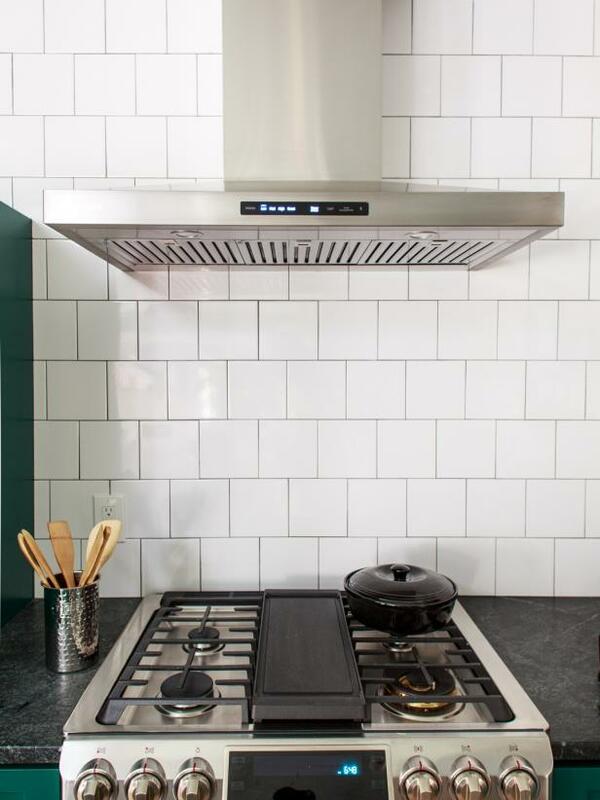 A black burner grate adds contrast against the stainless steel finish on this sleek stove. The matching overhead fan feels modern in stainless steel against optic white tile. 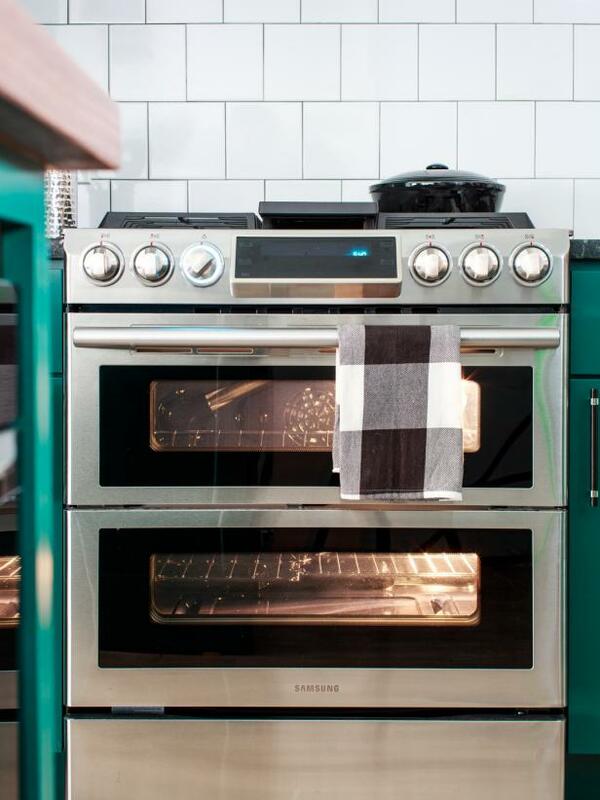 Double windows make it easy to see into this modern, stainless steel gas stove from Samsung. 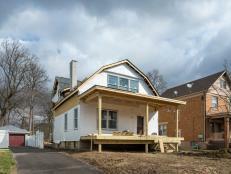 The kitchen island includes a custom space for the microwave. 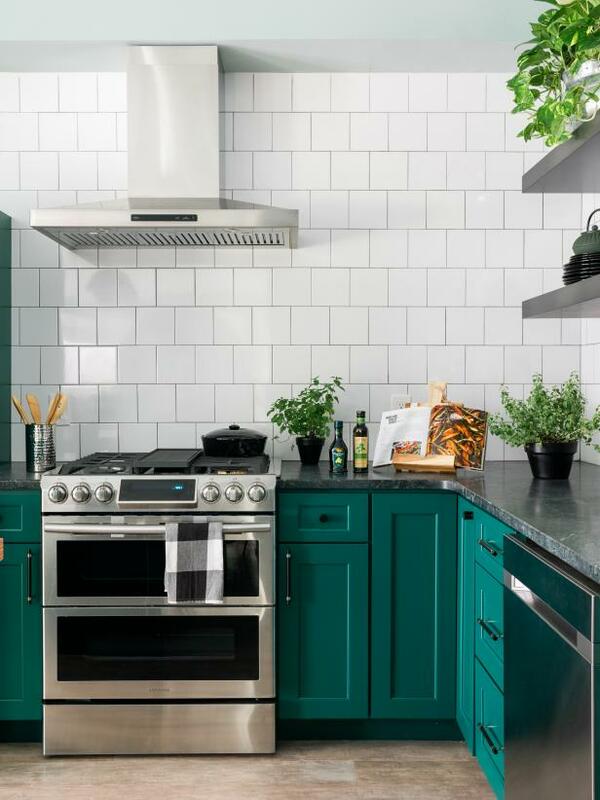 Using a mix of black and stainless steel finishes on the appliances in the kitchen unifies the space and keeps the color scheme feeling clean and modern. 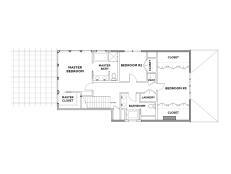 The L-shaped kitchen opens to the adjacent dining area with an open concept floor plan perfect for entertaining. Subtle patterns and rustic wood finishes are used in every detail to create a room infused with organic design and modern flair. 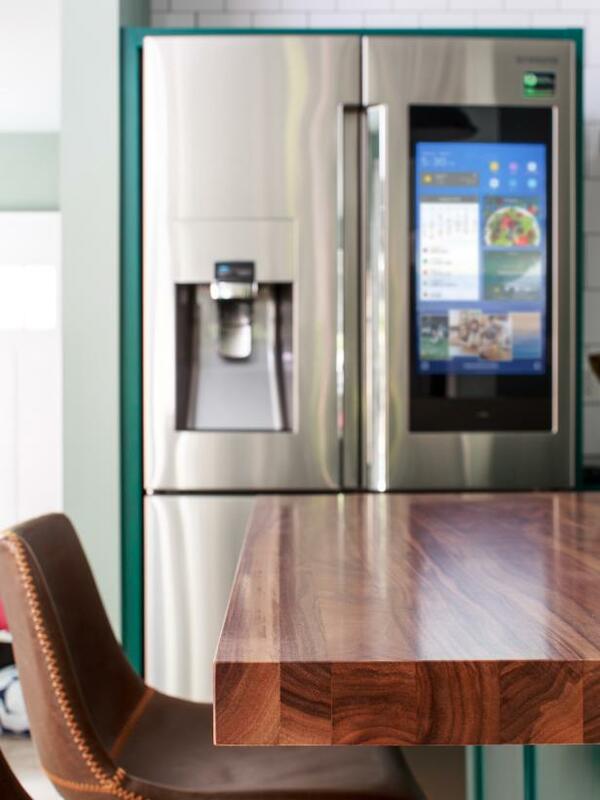 Streaming music or movies is easy on the interactive screen of this smart refrigerator. Using solid walnut for the island countertop and leather for the finish on the bar stools adds masculine details to this streamlined space. 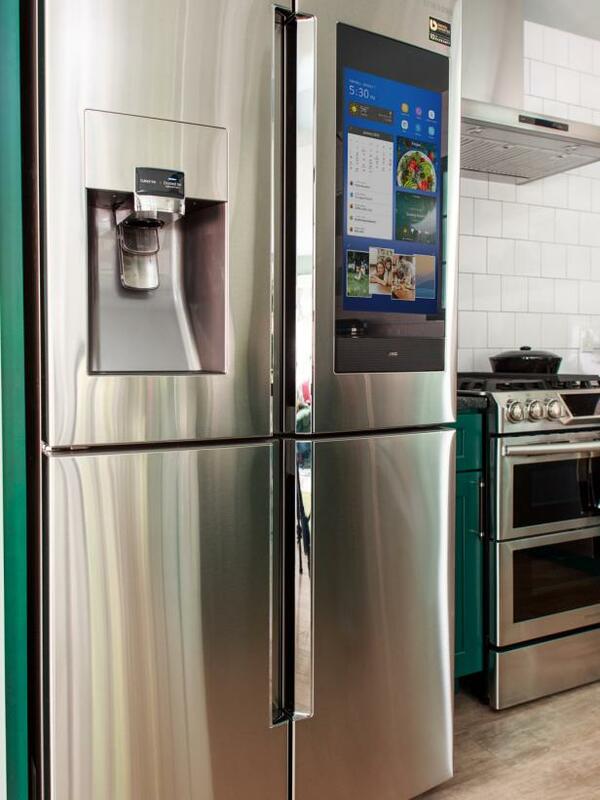 The stainless steel refrigerator provides lots of space with classic French door style and high-tech upgrades. 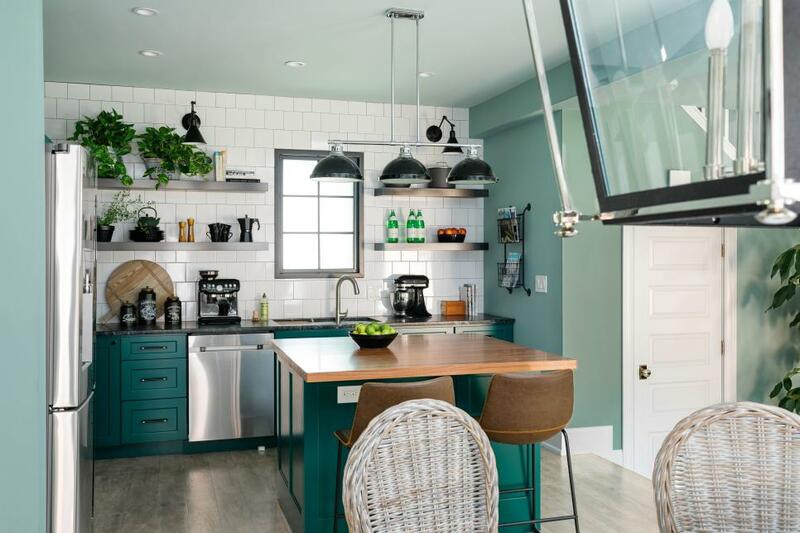 Soft tones of gray, white and green mix with organic elements and open shelving for to create a calm, simplified space for cooking and relaxing. 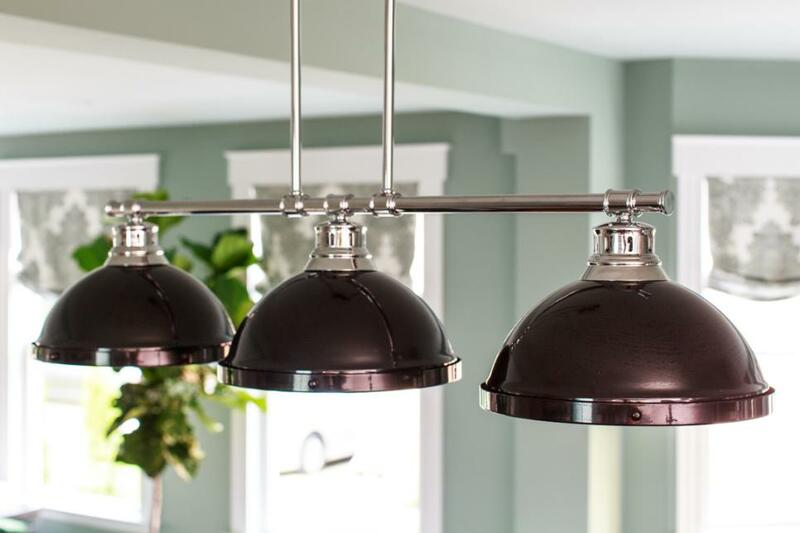 A trio of matte, black pendant lights hang above the kitchen island and add contrast and classic detail to the charming space. 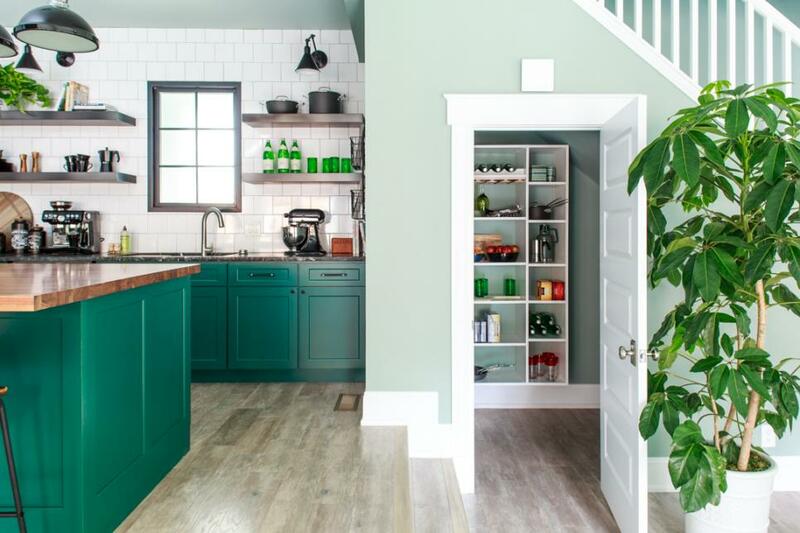 The spacious pantry under the stairs is a smart design that makes the most of what could be unused space. 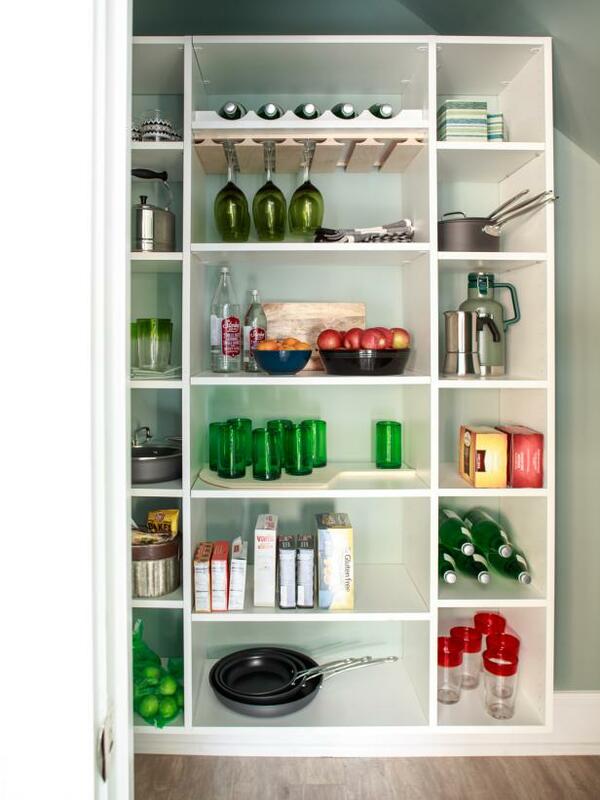 Open shelving in the pantry feels fresh in crisp white and makes it easy to quickly find what you need. 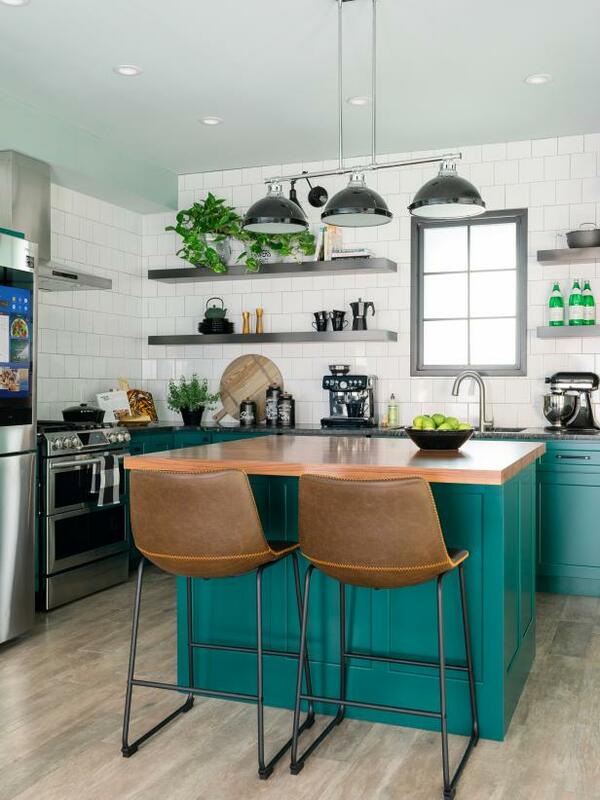 Matching leather chairs with contrasting topstitch provide extra seating at the kitchen island and add a handsome, modern accent to the room. 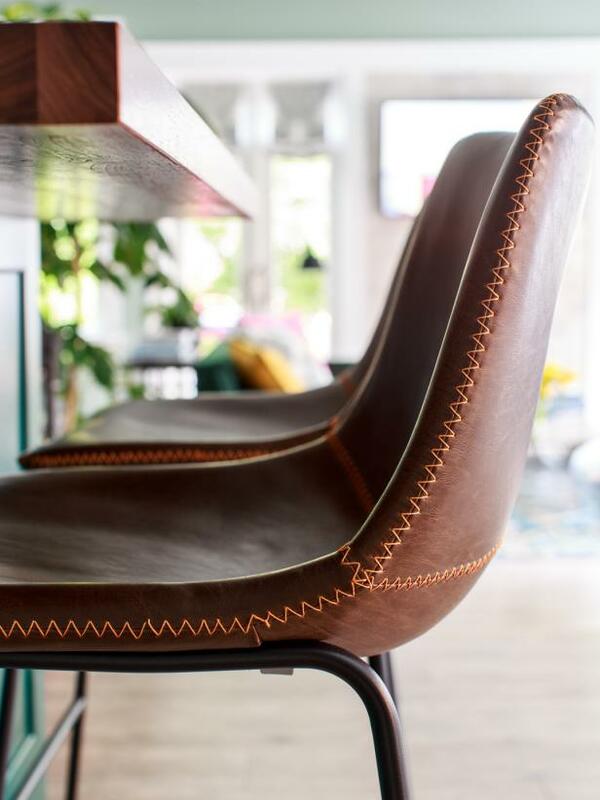 Contrasting topstitch on these leather chairs gives a subtle nod to the stitching on a baseball glove and adds a natural detail and texture to the seating area. 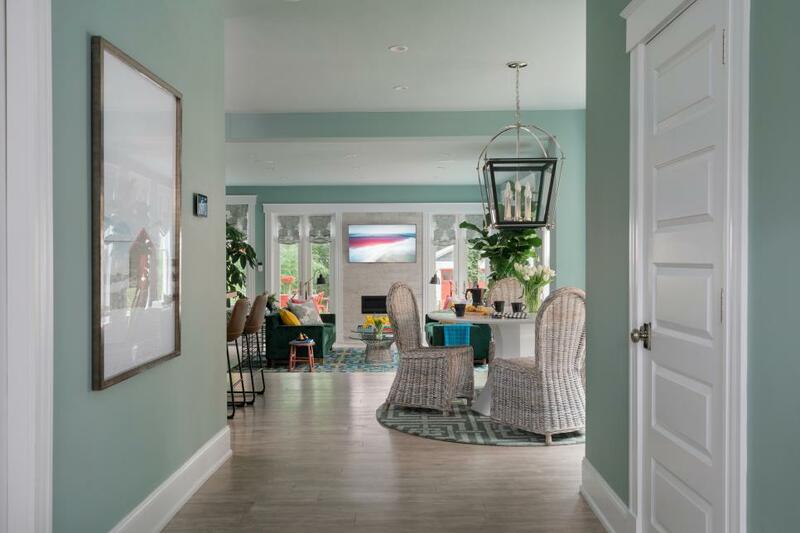 A round dining table with white wicker chairs is found just behind the kitchen island and provides more seating in this open floor plan space. 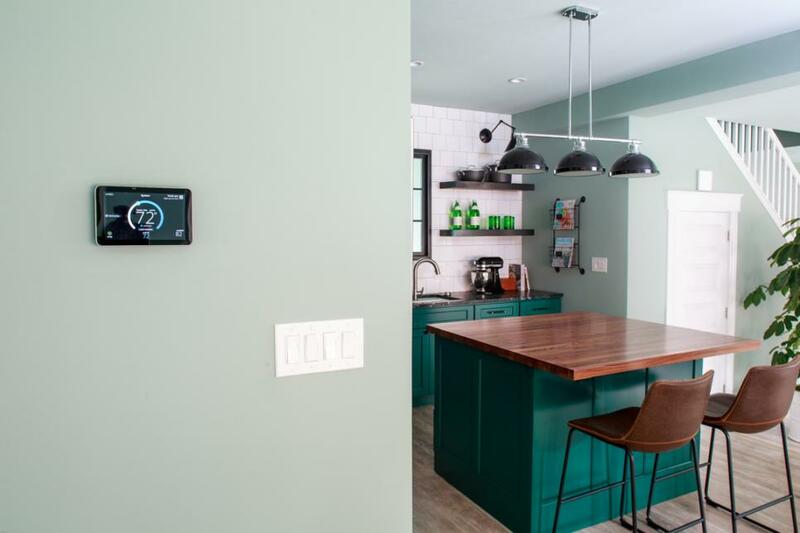 Finding just the right temperature is easy with this digital thermostat. 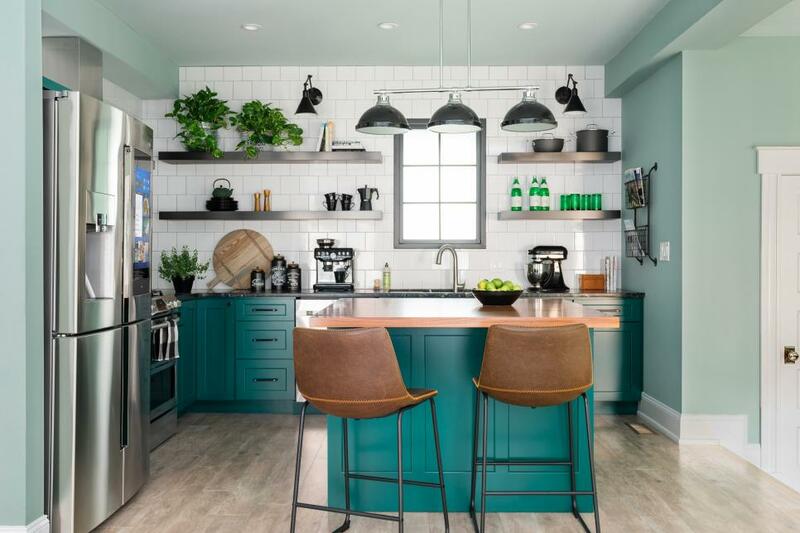 From large dinner parties to more intimate gatherings, the open-concept floor plan in the kitchen and dining areas makes this an inviting home for entertaining groups of all sizes.